Minerals Management Service, Map of active lease and infrastructure, PDF file. A multi-state government agency that promotes conservation and efficient recovery of domestic oil and natural gas resources while protecting health, safety and the environment. The Council of State Governments was founded during the Great Depression. The members of CSG include every elected and appointed state and territorial official in the United States. The National Conference of State Legislatures is a bipartisan organization that serves the legislators and staffs of the nation’s 50 states, its commonwealths and territories. The U.S. Conference of Mayors (USCM) is the official nonpartisan organization of cities with populations of 30,000 or more. There are 1,201 such cities in the country today. Each city is represented in the Conference by its chief elected official, the mayor. The National Association of Counties (NACo) is the only national organization that represents county governments in the United States. Founded in 1935, NACo provides services to the nation’s 3,066 counties. ICMA is the professional and educational organization for chief appointed managers, administrators, and assistants in cities, towns, counties, and regional entities throughout the world. Since 1914, ICMA has provided technical and management assistance, training, and information resources to its members and the local government community. The Pelamis device consists of a series of semi-submerged cylindrical sections linked by hinged joints. The wave-induced relative motion of these sections is resisted by hydraulic cylinders which pump high pressure oil through hydraulic motors via smoothing hydraulic accumulators. The hydraulic motors drive electrical generators to produce electricity. Power from all the joints is fed down a single umbilical cable to a junction on the sea bed. Several devices can be connected together and linked to shore through a single seabed cable. It is also interesting to note what happened to the project. The Portuguese minister of the economy officially opened the worlds first wave farm, consisting of three Pelamis wave energy converters, on 23 September 2008. The farm is located at the Aguçadoura Wave Park near Póvoa de Varzim in Portugal. It had an installed capacity of 2.25MW, enough to meet the average electricity demand of more than 1,500 Portuguese homes. The first Pelamis machine was installed at the site in July 2008. The installation followed the successful conclusion of work to replace a failed subsea buoyancy unit on the mooring system. After work was completed to replace the buoyancy units on the remaining two mooring connection points all three machines were simultaneously connected to the grid in September. The farm was successfully commissioned and operated during the summer and autumn of 2008, producing power into the Portuguese national grid. The project was originally conceived by the Portuguese renewable energy company, Enersis, which developed and financed the project and which was subsequently bought by the Australian infrastructure company Babcock & Brown for €490m in December 2005. Since the last quarter of 2008 Babcock & Brown had its shares suspended and has been in a managed process of selling its assets, including the Agucadoura project. In March 2009 Babcock & Brown went into voluntary administration. In November 2008 the Pelamis machines were brought back into harbor at Leixões due to a technical problem with some of the bearings for which a solution has been found. However the machines are likely to remain offline until a new partner is found to take over Babcock & Brown’s 77% share in the project. A second phase of the project was planned to increase the installed capacity from 2.25MW to 21MW using a further 25 Pelamis machines. Funding for Scotland’s first wave farm was announced by the Scottish Executive on 22 February 2007. It will have an installed capacity of 3 MW provided by four Pelamis machines. The farm will be located at the European Marine Test Centre off the coast of Orkney. The funding of just over £4 million is part of a £13 million funding package for marine power in Scotland. Pelamis Wave Power announced an order from E.on for a P-2 machine, in February 2009. The P-2 device is the next generation of Pelamis Wave Energy Converter and will be constructed at the company’s new facilities in Leith Docks, Edinburgh. In December 2009, Pelamis Wave Power announced a joint project with Vattenfall to develop a large wave farm off the coast of Shetland. Pelamis Wave Power has also expressed an interest in installing Pelamis devices at the Wave hub development off the north coast of Cornwall, in England and in the Pacific ocean off the coast of Tillamook, Oregon. Maybe these could be converted to get up the oil rather than their original use or do both at the same time – wouldn’t that be a novel approach to the problem of taking the oil spill out of the Bays, Estuaries and Gulf of Mexico? Very nifty – and its already designed sitting around not in use – Hmmm…. 2 of 3 Pelamis machines in the harbour of Peniche, Portugal. The petroleum industry generally classifies crude oil by the geographic location it is produced in (e.g. West Texas Intermediate, Brent, or Oman), its API gravity (an oil industry measure of density), and by its sulfur content. Crude oil may be considered light if it has low density or heavy if it has high density; and it may be referred to as sweet if it contains relatively little sulfur or sour if it contains substantial amounts of sulfur. These pages contain links to thousands of servers, sites, and documents contributed by individual authors that contain e-print information in discipline areas of interest to the Department of Energy’s research activities. These resources are organized into discipline-specific categories as indicated below. To view these resources and sites, simply select a discipline, browse the entries listed in alphabetical order, and click on any entry to leave the discipline you selected and enter a specific website. Use the “Back” button to return to the E-print Discipline you exited from. With the Wave Dragon wave energy converter large “arms” focus waves up a ramp into an offshore reservoir. 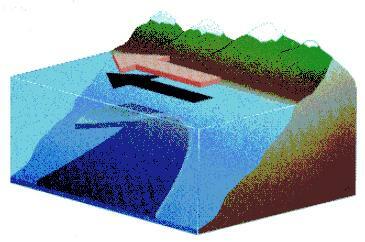 The water returns to the ocean by the force of gravity via hydroelectric generators. The Anaconda Wave Energy Converter is in the early stages of development by UK company Checkmate SeaEnergy. The concept is a 200 metre long rubber tube which is tethered underwater. Passing waves will instigate a wave inside the tube, which will then propagates down its walls, driving a turbine at the far end. The AquaBuOY is made by Finavera Renewables Inc. Energy transfer takes place by converting the vertical component of wave kinetic energy into pressurized seawater by means of two-stroke hose pumps. Pressurized seawater is directed into a conversion system consisting of a turbine driving an electrical generator. The power is transmitted to shore by means of a secure, undersea transmission line. A commercial wave power production facility utilizing the AquaBuOY technology is beginning initial construction in Portugal. The company has 250 MW of projects planned or under development on the west coast of North America. This technology seems to be on-hold as of February 2009. Finavera Renewables surrendered wave energy permits from FERC. Information on the long-term statistics of ocean waves can be found at the KNMI wave atlas. The US National Oceanic and Atmospheric Administration provides imagery and forecasts of wave height on a global scale. On-line NOAA animation of a user-specified region-of-interest can be set to either wave height or wave period forecasts. Petroleum is vital to many industries, and is of importance to the maintenance of industrialized civilization itself, and thus is critical concern to many nations. Oil accounts for a large percentage of the world’s energy consumption, ranging from a low of 32% for Europe and Asia, up to a high of 53% for the Middle East. Other geographic regions’ consumption patterns are as follows: South and Central America (44%), Africa (41%), and North America (40%). The world at large consumes 30 billion barrels (4.8 km³) of oil per year, and the top oil consumers largely consist of developed nations . . . Wait, that is so totally and completely confusing – does that mean there is a percentage of the energy of each country represented by those numbers in relation to coal, natural gas, and everything else or doing without? Or is it a percentage of the whole total usage of oil for energy needs? Control of oil spills is difficult, requires ad hoc methods, and often a large amount of manpower. The dropping of bombs and incendiary devices from aircraft on the Torrey Canyon wreck produced poor results; modern techniques would include pumping the oil from the wreck, like in the Prestige oil spill or the Erika oil spill. I wonder what they will have included there . . . Thermal Depolymerization (TDP) is a process using hydrous pyrolysis for the reduction of complex organic materials (usually waste products of various sorts, often known as biomass and plastic) into light crude oil. It mimics the natural geological processes thought to be involved in the production of fossil fuels. Under pressure and heat, long chain polymers of hydrogen, oxygen, and carbon decompose into short-chain petroleum hydrocarbons with a maximum length of around 18 carbons. The Hydro Thermal Upgrading (HTU) process was originally developed by Shell, and is now operated by Biofuel BV. It uses superheated water to produce oil from a range of biomass and domestic waste. A demonstration plant is due to start up in the Netherlands said to be capable of processing 64 tons of biomass (dry basis) per day into oil. Thermal depolymerization differs in that it contains a hydrous process followed by an anhydrous cracking / distillation process, although upgrading of the raw HTU product is also possible. Thermal depolymerization is similar to the geological processes that produced the fossil fuels used today, except that the technological process occurs in a timeframe measured in hours. Until recently, the human-designed processes were not efficient enough to serve as a practical source of fuel—more energy was required than was produced. Many previous methods which create hydrocarbons through depolymerization used dry materials (or anhydrous pyrolysis), which requires expending a lot of energy to remove water. However, there has been work done on hydrous pyrolysis methods, in which the depolymerization takes place with the materials in water. In U. S. patent 2,177,557, issued in 1939, Bergstrom and Cederquist discuss a method for obtaining oil from wood in which the wood is heated under pressure in water with a significant amount of calcium hydroxide added to the mixture. In the early 1970s Herbert R. Appell and coworkers worked with hydrous pyrolysis methods, as exemplified by U. S. patent 3,733,255 (issued in 1973), which discusses the production of oil from sewer sludge and municipal refuse by heating the material in water, under pressure, and in the presence of carbon monoxide. 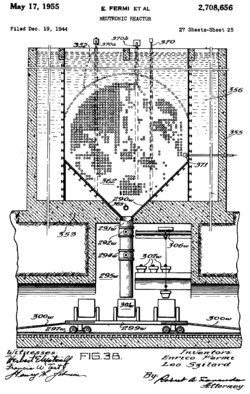 An approach that exceeded break-even was developed by Illinois microbiologist Paul Baskis in the 1980s and refined over the next 15 years (see U. S. patent 5,269,947, issued in 1993). The technology was finally developed for commercial use in 1996 by Changing World Technologies (CWT). Brian S. Appel (CEO of CWT) took the technology in 2001 and expanded and changed it into what is now referred to as TCP (Thermal Conversion Process), and has applied for several patents (see, for example, published patent application US 2004/0192980). A Thermal Depolymerization demonstration plant was completed in 1999 in Philadelphia by Thermal Depolymerization, LLC, and the first full-scale commercial plant was constructed in Carthage, Missouri, about 100 yards (91m) from ConAgra Foods‘ massive Butterball turkey plant, where it is expected to process about 200 tons of turkey waste into 500 barrels (21,000 US gallons or 80 m³) of oil per day. In the Changing World Technologies (CWT) process, the feedstock material is first ground into small chunks, and mixed with water if it is especially dry. It is then fed into a pressure vessel reaction chamber where it is heated at constant volume to around 250 °C. Similar to a pressure cooker (except at much higher pressure), steam naturally raises the pressure to 600 psi (4 MPa) (near the point of saturated water). These conditions are held for approximately 15 minutes to fully heat the mixture, after which the pressure is rapidly released to boil off most of the water (see: Flash evaporation). The result is a mix of crude hydrocarbons and solid minerals. The minerals are removed, and the hydrocarbons are sent to a second-stage reactor where they are heated to 500 °C, further breaking down the longer hydrocarbon chains. The hydrocarbons are then sorted by fractional distillation, in a process similar to conventional oil refining. The CWT company claims that 15 to 20% of feedstock energy is used to provide energy for the plant. The remaining energy is available in the converted product. Working with turkey offal as the feedstock, the process proved to have yield efficiencies of approximately 85%; in other words, the energy contained in the end products of the process is 85% of the energy contained in the inputs to the process (most notably the energy content of the feedstock, but also including electricity for pumps and natural gas or woodgas for heating). If one considers the energy content of the feedstock to be free (i.e., waste material from some other process), then 85 units of energy are made available for every 15 units of energy consumed in process heat and electricity. This means the “Energy Returned on Energy Invested” (EROEI) is (6.67), which is comparable to other energy harvesting processes. Higher efficiencies may be possible with drier and more carbon-rich feedstocks, such as waste plastic. By comparison, the current processes used to produce ethanol and biodiesel from agricultural sources have EROEI in the 4.2 range, when the energy used to produce the feedstocks is accounted for (in this case, usually sugar cane, corn, soybeans and the like). These EROEI values are not directly comparable, because these EROEI calculations include the energy cost to produce the feedstock, whereas the above EROEI calculation for thermal depolymerization process (TDP) does not. The process breaks down almost all materials that are fed into it. TDP even efficiently breaks down many types of hazardous materials, such as poisons and difficult-to-destroy biological agents such as prions. As reported on 04/02/2006 by Discover Magazine, the Carthage plant was producing 500 barrels per day (79 m3/d) of oil made from 270 tons of turkey entrails and 20 tons of hog lard. This represents an oil yield of 22.3 percent. I worked on an offshore research vessel about 15 years ago. I was the computer guy for my boat. We were a part of a fleet of vessels that laid cable on the bottom of the ocean and created a 4D map of the ocean floor. We mostly worked offshore in LA or TX. There is tons of that going on out there every day, 24 hours a day. It is really nothing new. If you have never been on a boat off the coast of LA, then you probably would not believe all the stuff going on. There are boats, ships, and structures (production platforms, rigs, well heads, etc) everywhere. It looks like a city at night. That is not even counting the commercial fisherman. This block is south of Cameron, LA which is just at the TX and LA border. It is in the normal oil field. It is not anywhere close to us. If you have have ever been to the beach in Cameron or Holly Beach then you will quickly see that you are not missing much. Holly Beach is nestled between Mud Lake and the muddy Gulf. There is a highway that runs between Cameron and Port Aurthur. It is much like 30A except it goes right along the waters edge. It is great for fishing and laying out on the rocks (that are there to keep the road from washing away). You can actually do a Google Maps street view of the area. I am sure they would never turn our coast into something like that. Oil is LA and TX primary industry and tourism is ours. It just doesn’t make sense to jeopardize our primary source of income. A mixture of gas and condensate oil has been leaking from the West Atlas drilling rig in the Timor Sea since Friday morning. As further evidence that offshore oil exploration can be risky, a rig off the northwest coast of Australia recently suffered a catastrophic accident. Caused by a fractured well, the accident has caused oil to spill right into the middle of an important nursery ground and migration route for whales and turtles and it will continue to contaminate this area for another two months! It will take more than three weeks to put a second replacement rig in place and four weeks of drilling before the rig can tap the leaking well. 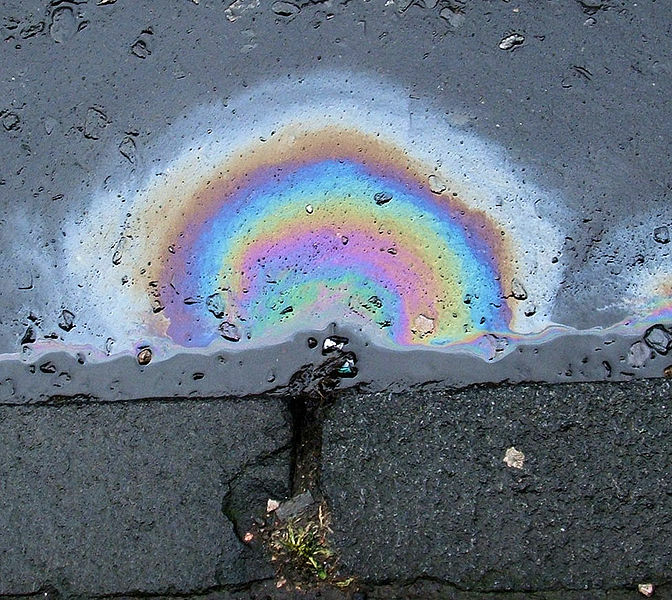 Authorities are still calculating the total amount of oil spilled to date. It is funny that we are talking about this today. We just looked out our window and saw an oil tanker passing by our house in Seagrove. I have never seen that before off our beaches. Does anyone know why a ship would be visible from shore? They are small businesses, which may have a handful of employees, or even one, who are working in back yard garages, no different than when Michael Dell, Michael Buell, Bill Gates were starting in their own businesses. There are many people working on many technologies right now, because discovering the right engine or energy source/conversion, will rule the world in almost no time, relatively speaking. Other leaders in energy technology might be large, profitable companies like Google, which could give huge cash prizes as incentives to increase focus in the field, in the way of contests. They have already explored this on a small scale. Well, I thought that one was it – I mean, I thought it was a photo of the oil drilling accident at the Gulf of Mexico Horizon Deepwater that is spewing crude oil into the Gulf from three different places on the sea floor right now – but it isn’t. This is the one I was trying to find – from its wikipedia entry. An explosion on the Deepwater Horizon offshore drilling rig, operating in the Gulf of Mexico off the coast of Louisiana, on April 20, 2010, resulted in a fire that sank the rig and caused a massive-scale oil spill. At least 18 oil workers were killed when a drilling rig hit an oil platform in stormy weather, spilling gas and oil into the Gulf of Mexico, the state-owned oil company said. Seven workers were still missing. Rescuers pulled 61 oil workers to safety from storm-tossed waters Wednesday but have yet to control the oil and gas leak, Mexico’s oil monopoly Petroleos Mexicanos, or Pemex, said in a news release. Eighty-one workers and five rescue personnel abandoned a subcontractor’s drilling rig known as the Usumacinta on Tuesday, after it hit the Kab 101 light-production platform and damaged a valve amid 25-foot waves and winds gusting to 80 mph. “The personnel abandoned the platform, even though we know the conditions at sea were bad, but there was no other choice,” Ortega Flores said. Once in the water, the waves battered the workers’ orange-colored, covered life rafts. Pemex said it would take three to five days to control the leak caused by Tuesday’s accident, but noted that it mainly involved gas. 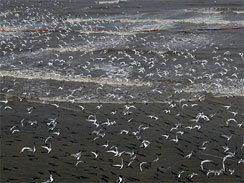 “The spill of crude oil into the sea has been less than originally thought,” the company said. The Usumacinta, a mobile, self-raising drilling rig, was set up next to Kab 101, preparing to drill a well close to the platform. The force of the waves caused of the rig’s “legs” to hit the valve assembly of the platform, causing it to leak oil and gas. The storm forced Mexico’s main oil ports to close. They remained closed Wednesday, Pemex said. I really don’t think he needs to start his swim from the shore either . . .
Maybe Rush Limbaugh can swim around out there in the crude oil for awhile and find out for us whether it is breaking down by itself or not. In fluid dynamics, the Boussinesq approximation for water waves is an approximation valid for weakly non-linear and fairly long waves. The approximation is named after Joseph Boussinesq, who first derived them in response to the observation by John Scott Russell of the wave of translation (also known as solitary wave or soliton). The 1872 paper of Boussinesq introduces the equations now known as the Boussinesq equations. The Boussinesq approximation for water waves takes into account the vertical structure of the horizontal and vertical flow velocity. This results in non-linear partial differential equations, called Boussinesq-type equations, which incorporate frequency dispersion (as opposite to the shallow water equations, which are not frequency-dispersive). 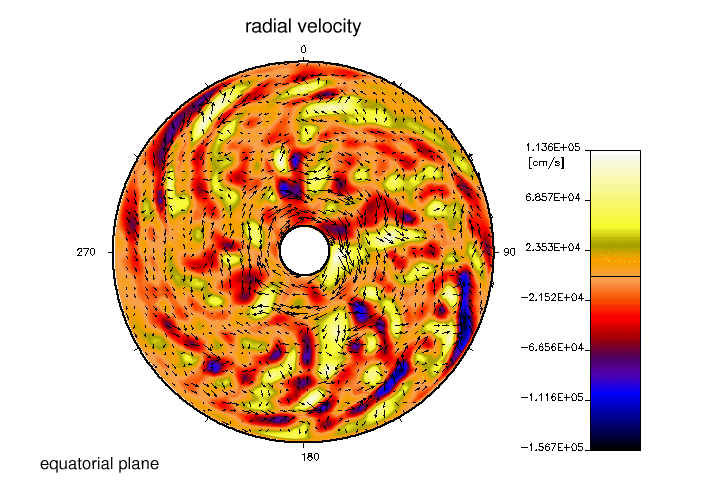 In coastal engineering, Boussinesq-type equations are frequently used in computer models for the simulation of water waves in shallow seas and harbours. Ian MacDonald, an oceanography specialist at Florida State University, estimated that oil might be leaking at a rate of 25,000 barrels (1,100,000 US gal) a day and that the oil slick as of May 2, 2010, might already contain more than 9,000,000 US gallons (210,000 bbl). He later estimated the spill to be about 12,000,000 US gallons (290,000 bbl). BP originally estimated up to 1,000 barrels (42,000 US gal) a day was leaking from the wellhead. On April 28, the NOAA said that the rate was probably five times that initially estimated by BP, i.e. 5,000 barrels (210,000 US gal). Other sources using satellite imagery have put that number as high as 5,000 to 10,000 barrels (210,000 to 420,000 USgal) a day. Ixtoc I exploratory oil well in the Gulf of Mexico. 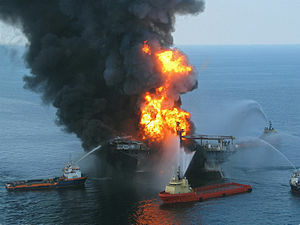 Suffered a similar blowout and is recognized as the second largest oil spill in history. Drilling is a Dirty Business. At each stage of testing, exploration, and production, the oil and gas business produces contaminated water, uses toxic drilling muds, and periodically spills oil and toxic liquids into the ocean. Pollutants like mercury and persistent hydrocarbons contaminate fish and sea life near platforms and massive spills kill seabirds, sea turtles, fish and marine mammals. Accidents Happen. Based on the experience of other Gulf drilling operations, small spills, like the 500 gallon spill off a Louisiana rig a few years ago, would be common. A catastrophic spill—one that could close down coastal tourism for weeks or months, is a real possibility. Even if they drill only for natural gas, the tankers, pipelines, and on-shore facilities can experience accidents. Accidents aren’t always from a rig blowout – they can also include pipeline ruptures, tanker collisions, and other leaks. 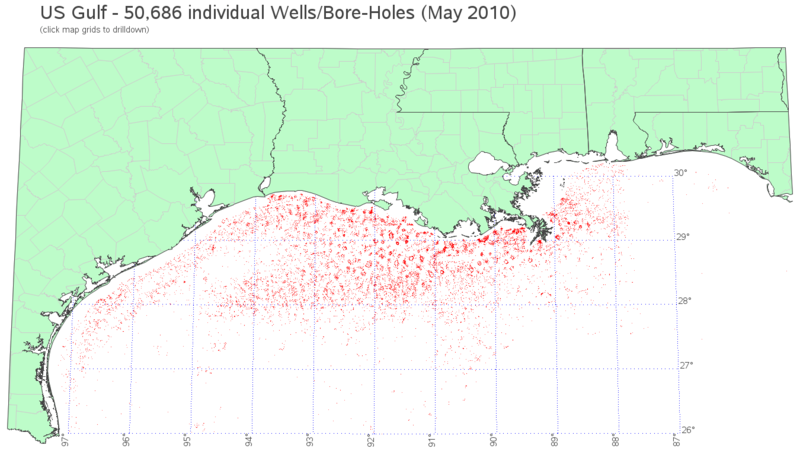 There have been 187 oil spills offshore just in the Gulf of Mexico between 1981 and 2005 – about 1 per month. Spills under 1,000 barrels (42,000 gallons) make up 97% of all spills, yet are not required to be reported in the federal Oil Spill Risk Analysis. Most accidents on rigs are due to human error, not technology. Thus, the question is not whether an accident will occur, but when. Discharging, on average, 180,000 gallons per well-start of toxic drilling fluids, cuttings, and “produced waters,” containing arsenic, lead, cadmium and mercury. Generating large volumes of air emissions, including benzene and napthalene. Bringing to the surface and releasing naturally occurring radioactive materials at levels higher than those legally released from nuclear power plants. Spilling diesel oil during the rig-refueling process. Not much information has come our about the PEMEX drilling rig accident. A new article says that 21 people were killed and that production should be resuming soon. Most reports seem to blame the weather. That doesn’t seem to be an adequate root cause analysis. Perhaps more information will be released later. Plasma Converters use powerful electric arcs to reduce and extract energy from waste. From among the list on this page below – is the De-asphalter. The beaches along the Gulf Coast are going to need that – but maybe not the way this describes doing it, my note. A de-asphalter is a unit in a crude oil refinery or bitumen upgrader that separates asphalt from crude oil or bitumen. The de-asphalter unit is usually placed after the vacuum distillation tower. It is usually a solvent de-asphalter unit, SDA. The SDA separates the asphalt from the feedstock because light hydrocarbons will dissolve aliphatic compounds but not asphaltenes. The output from the de-asphalter unit is de-asphalted oil (“DAO”) and asphalt. DAO from propane de-asphalting has the highest quality but lowest yield, whereas using pentane may double or triple the yield from a heavy feed, but at the expense of contamination by metals and carbon residues that shorten the life of downstream cracking catalysts. If the solvent is butane the unit will be referred to as a butane de-asphalter (“BDA”) and if the solvent is propane, it will be called a propane de-asphalter (“PDA”) unit. ^ John J. McKetta (1992). Petroleum Processing Handbook. CRC Press. p. 536. ISBN 9780824786816. http://books.google.com/books?id=Xlqsr_K59mcC&pg=PP1&dq=McKetta,+John+J.+Petroleum+Processing+Handbook..
States receive a share of the royalties the oil and gas companies pay the federal government for wells in the three-mile zone just outside state-controlled waters. That amounted to an additional $65.6 million for Alabama, Alaska, California, Florida, Louisiana, Mississippi and Texas in federal fiscal year 2007. The United States has more than 12,000 miles of coastline, but nearly 95 percent of the oil produced in the federal coastal waters comes from wells in the Gulf of Mexico along the 860-mile stretch between the southern tip of Mexico and the Alabama-Florida border. States can collect royalties for drilling in their own waters, but activity there is largely constrained to Alaska. Do you mean to tell me that the sum total of what all these states together received from the oil companies for the drilling leases that are destroying the Gulf of Mexico, and that are using our national resources for their own profits was a total of $65.6 million dollars? There is more damage occurring per minute in the Gulf of Mexico right this very minute than that total would cover fixing. Are they really getting away with that? After Hurricane Katrina, Congress expanded offshore drilling to a limited area off the western coast of Florida. As part of that deal, it directed an additional $250 million a year through 2010 to help fill the state coffers of Alabama, Alaska, California, Louisiana, Mississippi and Texas. Louisiana is expected to get more than half the money, and its voters decided to spend all of it on coastal wetland restoration. Alford, M.H., R. Lien, H. Simmons, J. M. Klymak, Y. Yang, D. Tang and M. Huei Chang (2010), Speed and evolution of nonlinear internal waves transiting the South China Sea, J. Phys. Oceanogr., submitted. MacKinnon, J.A., M. H. Alford, P. Bouruet-Aubertot, N. Bindoff, S. Gille, J. Girton, M. C. Gregg, R. Hallberg, E. Kunze, A. Naveira Garabato, H. Phillips, R. Pinkel, K. Polzin, T. B. Sanford, H. L. Simmons, and K. G. Speer (2010), Using global arrays to investigate internal-waves and mixing. In “Proceedings of the “OceanObs’09: Sustained Ocean Observations and Information for Society Conference,” Venice, Italy, 21-25 September 2009, J. Hall, D. Harrison, and D. Stammer, editors. Using global arrays to investigate internal-waves and mixing. In “Proceedings of the “OceanObs’09: Sustained Ocean Observations and Information for Society Conference,” Venice, Italy, 21-25 September 2009, J. Hall, D. Harrison, and D. Stammer, editors; MacKinnon, J.A., M. H. Alford, P. Bouruet-Aubertot, N. Bindoff, S. Gille, J. Girton, M. C. Gregg, R. Hallberg, E. Kunze, A. Naveira Garabato, H. Phillips, R. Pinkel, K. Polzin, T. B. Sanford, H. L. Simmons, and K. G. Speer (2010). What is that 50 cents per well? I didn’t do the math – I’m just guessing . . . The Interior Department has agreed in principle to acquire the mineral rights under Big Cypress National Preserve, Florida Panther National Wildlife Refuge, and Ten Thousand Islands National Wildlife Refuge from Collier Resources Company, virtually ensuring no new oil and gas development in the three areas, Interior Secretary Gale Norton announced today. At the same time, Norton announced the Department has agreed in principle to settle litigation with oil companies that own interests in the Destin Dome Unit, a large natural gas discovery in the Eastern Gulf of Mexico offshore Florida. The companies — Chevron, Conoco and Murphy Oil — will relinquish seven of nine leases in the unit that were the subject of the litigation in exchange for $115 million. The remaining two leases, to be held by Murphy, will be suspended until at least 2012 under the terms of the settlement. Under the agreement with Collier Resources, the Interior Department intends to exchange $120 million in monetary considerations — either cash or bidding credits that can be used for bids or royalties on future Outer Continental Shelf sales — for the mineral rights held by Collier Resources under 765,000 acres of the Everglades. Congress must pass legislation to finalize the deal. Considers legislation about fisheries and wildlife, public lands, Native Americans, irrigation and reclamation, Mineral lands and mining, and oceanography. Deals with pollution, highway construction and repair, environmental aspects of the continental shelf, toxic substances other than pesticides, fisheries and drinking water and wastewater systems. ECOS is nonprofit comprised of state environmental agency or commission heads from around the country. The purpose of ECOS is to improve the capability of state environmental agencies in order to protect and improve human health and the environment. SERC is a unit of the Smithsonian Institution. The research and education center is “dedicated to understanding ecological processes that sustain life at the land/sea margin” and “committed to finding solutions to grand environmental challenges that we face in the 21st century”. The Institute was established in 2000 with funding from the Centers for Disease Control and Prevention. It’s original mission was to carry out bioterrorism and preparedness research, but has since evolved to include addressing emerging infectious diseases, naturally occurring or introduced by terrorists. The Web site provides updates on news, congressional testimony, and independent research projects. An agency of the U.S. Department of Health and Human Services based in the metro Atlanta area. It was created to protect public health and safety by providing information from the federal government relating to public health and disease management. The CDC closely monitors disease outbreaks across the states. The U.S. Transportation Department offers news and information from the federal cabinet agency. The Surface Transportation Policy Project is a nationwide coalition working to ensure safer communities and smarter transportation choices that enhance the economy, improve public health, promote social equity, and protect the environment. The U.S. Department of Transportation’s Federal Highway Administration provides links to each state’s Department of Transportation. A network of state legislative sportsmen’s caucuses. Now with 38 state legislative sportsmen’s caucuses representing more than 1,200 state legislators, NASC facilitates the interaction and idea exchange among state caucus leaders and the outdoor community. Going to go take a bath now – and think about it. I might come back to this in a little while – and maybe not. I don’t know yet. If I do, it will be on a new post after this one. Hmmmm…. unbelievable.